The Build a Better Burb website evolved from a design competition that was sponsored by the Long Island Index in 2010. 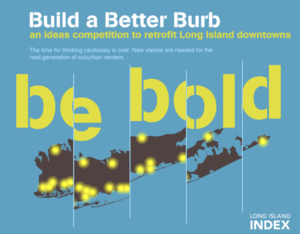 The Build a Better Burb competition called for bold ideas from architects, urban designers, planners, and visionaries for the underutilized land in Long Island’s downtowns. The goal was to reimagine what might be possible for our region. Seeing the scope of the problems facing Long Island, we realized that small tinkering at the edges wasn’t going to stop the brain drain or create vibrant town centers or convince businesses to locate here in order to reinvigorate our sagging economy. We knew there was land to build on – 8,300 acres, in fact, within just ½ mile of our over 100 downtown communities. But where were the exciting ideas of what we might create there? For too long, there has been a crisis of imagination. Bold new ideas are urgently needed. So in recruiting designers for the competition, we asked that they drop any preconceived notions about what was or was not possible. We asked, ‘What would you do on these acres of opportunity? Build a car-free community? Plant an oasis of urban agriculture? Produce renewable energy and with it, provide well-paying green jobs? Use landscape systems to repair regional ecologies? Enhance public space and the civic realm? The Build a Better Burb competition asked for innovative solutions at a variety of scales, from small-scale to regional. It sought both prototypical ideas as well as concepts tailored to particular downtowns. Photographs, renderings, plans, diagrams and other illustrations were requested to illustrate entrants’ ideas. Read the entire design brief.